After months of rumors, Nvidia has finally unleashed its next-gen 28nm graphics tech, codenamed "Kepler." As usual, the series kicks off with a flagship single-GPU, the GeForce GTX 680, which is said to be the company's fastest and most power efficient offering to date, courtesy of the new GK104 graphics processor. On top of the raw speed and power improvements, Nvidia says Kepler cards introduce new tech to provide consistently smooth frame rates in games -- something we look forward to testing when we get a review sample. The GK104 contains four GPCs with a total of eight SMXs, 1536 CUDA cores, eight geometry units, four raster units, 128 texture units, and 32 ROP units. The base clock is 1006MHz, but it can dynamically boost to 1058MHz and beyond for more performance (about 5% supposedly). The card also carries 2GB of GDDR5 VRAM running at 6008MHz with a 256-bit interface providing 6.0Gb/s of throughput. Dual six-pin power connectors feed the card's TDP of 195W -- notably lower than the GTX 580 (244W) and Radeon HD 7970 (250W). We'll have to confirm all this for ourselves when we get our hands on a card, but the company also provided some reference performance comparisons between the Radeon HD 7970 when running various games at 2560x1600 and max quality settings. 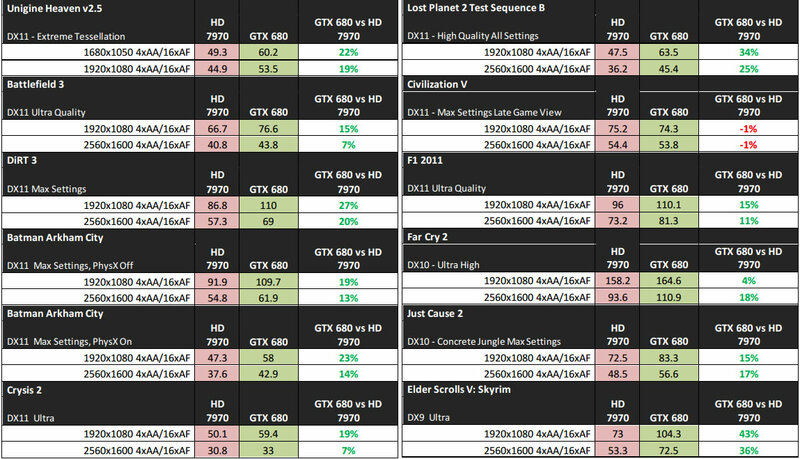 With those parameters, the GTX 680 outpaces the HD 7970 by an average of about 15%. It shows a dramatic lead in some titles, such as 36% in Skyrim (to be expected with Nvidia's driver optimizations), while the card slips behind its rival by 1% in Sid Meier's Civilization V.
As noted, Kepler comes with some new gamer-oriented feature called Adaptive VSync that should help stabilize frame rates. As you're likely aware, Vertical Sync is a game setting that displays new frames synchronously with your display's refresh rate (generally 60Hz -- or 60fps) to prevent artifacts such as screen tearing. The problem is, if your graphics card can't keep up at that pace and slips below the 60fps mark -- even just a little bit Nvidia says -- you're likely to experience stuttering as your card drops down to 30fps or worse. Adaptive VSync solves the issue by dynamically enabling and disabling VSync as dictated by your frame rate. The feature will be available in Nvidia's R300 driver family and it won't be specifically limited to the GTX 680 or other GTX 600 series cards for that matter. The GTX 680 includes other enhancements such as a new display engine for multi-monitor setups, NVENC (a hardware-based H.264 video encoder), as well as FXAA and TXAA. We'll go over everything in more detail in our review (again, we're still waiting on a sample).